Labatt Brewing Company Limited (French: La Brasserie Labatt Limitée) is a Belgian-owned brewery in Canada, founded by John Kinder Labatt in 1847 in London, Ontario. Labatt is the largest brewer in Canada. In 1995, it was purchased by Belgian brewer Interbrew. In 2004, Interbrew merged with Brazilian brewer AmBev to form InBev. In 2008, InBev merged with American brewer Anheuser-Busch to form Anheuser-Busch InBev (abbreviated as AB InBev), making Labatt part of Anheuser-Busch InBev. On October 10, 2016, an over $100 billion merger between Anheuser-Busch InBev and SABMiller closed. Labatt is now part of the new company, Anheuser-Busch InBev SA/NV, which is trading as BUD on the New York Stock Exchange (ABI:BB in Brussels). In the United States, Labatt brand beers are sold under license by Labatt USA, which since 2009 has been fully independent of the Canadian firm and a subsidiary of the privately held North American Breweries of Rochester, New York. In 1901, Prohibition in Canada began through a provincial legislation in Prince Edward Island. In 1916, prohibition was instituted in Ontario as well, affecting all 64 breweries in the province. Although some provinces totally banned alcohol manufacture, some permitted production for export to the United States. 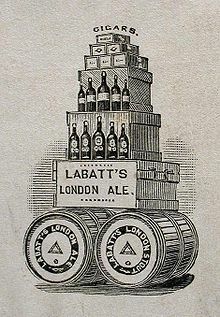 Labatt survived by producing full strength beer for export south of the border and by introducing two "temperance ales" with less than two per cent alcohol for sale in Ontario. However, the Canadian beer industry suffered a second blow when Prohibition in the United States began in 1919. When Prohibition was repealed in Ontario in 1926, just 15 breweries remained, and only Labatt retained its original management. This resulted in a strengthened industry position. In 1945, Labatt became a publicly traded company with the issuance of 900,000 shares. John and Hugh Labatt, grandsons of founder John K. Labatt, launched Labatt 50 in 1950 to commemorate 50 years of partnership. The first light ale introduced in Canada, Labatt 50 was Canada's best-selling beer until 1979. In 1951, Labatt launched its Pilsener Lager; when it was introduced in Manitoba, the beer was nicknamed "Blue" for the colour of its label and the company's support of Winnipeg's Canadian Football League (CFL) franchise, the Blue Bombers. The brew-master at the time was Robert Frank Lewarne (b. 1921 Toronto, Ont. Canada—R.F. Lewarne also headed the team that produced the famous Labatt 50—mainly for the Quebec market). The nickname "Blue" stuck and in 1979, Labatt Blue claimed the top spot in the Canadian beer market. It lost this status in the late eighties to Molson Canadian, but over the next decade, it periodically regained the top spot as consumer preferences fluctuated. In 2004, Budweiser took the top spot, pushing Blue to third for the first time in twenty-five years. However, since Labatt has brewed Budweiser (and other Anheuser-Busch products) in Canada under licence since the 1980s, Labatt likely did not suffer from this shift. Moreover, Labatt Blue remains the best selling Canadian beer in the world, based upon worldwide sales. Labatt was also the majority owner of the Toronto Blue Jays from their inception in 1976 until 1995, when Interbrew purchased Labatt. Labatt's innovations include the introduction of the first twist-off cap on a refillable bottle in 1984. In 1989, Labatt's had the opportunity to hire Canadian model Pamela Anderson as a Labatt's Blue Zone Girl after she was picked out of the crowd by a TV camera man at a BC Lions football game wearing a Blue Zone crop-top. Photographer and boyfriend Dann Ilicic produced the Blue Zone Girl poster on his own after Labatt's refused to have anything to do with it. Later, Labatt's did buy 1000 posters to deal with consumer demand. In 1995, Labatt was acquired by the large Belgian multinational brewer Interbrew (now InBev), the world market leader. Labatt is part-owner of Brewers Retail Inc., operator of The Beer Store retail chain, which—protected by legislation—has over 90% market share of Ontario off-premises beer sales. In early 2007, Labatt also acquired Lakeport Brewing Company of Hamilton, Ontario. In 2009, the company sold Labatt USA, including the American rights to its core Labatt products (such as Blue, Blue Light, and Labatt 50) to North American Breweries, and agreed to brew those brands on Labatt USA's behalf until 2012. This sale was mandated by the U.S. Department of Justice for competitive reasons following InBev's merger with Anheuser-Busch, since Budweiser and Labatt Blue were both among the top brands in upstate New York, despite the latter having less than 1% market share in the U.S. overall. The sale did not include U.S. rights to Labatt products not carrying the "Labatt" label, such as Kokanee or Alexander Keith's, which are now distributed in the U.S. by Anheuser-Busch. Moreover, the underlying intellectual property (such as the Labatt trademarks) remains the property of the Canadian firm. Finally, the sale did not affect Labatt's Canadian operations in any way, however Anheuser-Busch InBev retains full control of the Labatt brand portfolio within Canada. Labatt's US headquarters were originally located in Buffalo for some years. Labatt then decided to relocate their headquarters to Norwalk, Connecticut for a time. In 2007 Labatt decided to relocate their US operations back to Buffalo due to strong sales in the city and closer proximity to their Ontario operations. Labatt USA is now owned by North American Breweries of Rochester, New York. Labatt's Toronto (Rexdale) brewery was built in 1970 and ceased operations in 2005 and was demolished by 2007, thus ending the brewery's ties to the city. Labatt 50 is a 5% abv ale launched in 1950 to commemorate 50 years of partnership between the grandsons of the brewer's founder. The first light-tasting ale introduced in Canada, Labatt 50 was Canada's best-selling beer until 1979 when, with the increasing popularity of lagers, it was surpassed by Labatt Blue. Labatt 50 is fermented using a special ale yeast, in use at Labatt since 1933. Labatt Blue is a 5% abv pale lager. There are 11.53 US fluid ounces (341 ml) of beer in a bottle of Labatt Blue. There are 355 mL of beer in a standard can of Labatt Blue/Bleue in Canada with other volumes available in specific regions of the country. Blue, the company's flagship brand has entered a number of international beer ratings competitions and has always performed notably well. In 2003, Labatt Blue received a Gold Quality Award at the World Quality Selections, organized yearly by Monde Selection. Labatt had patented a specific method for making ice beer in 1997, 1998 and 2000: "A process for chill-treating, which is exemplified by a process for preparing a fermented malt beverage wherein brewing materials are mashed with water and the resulting mash is heated and wort separated therefrom. The wort is boiled cooled and fermented and the beer is subjected to a finishing stage, which includes aging, to produce the final beverage. The improvement comprises subjecting the beer to a cold stage comprising rapidly cooling the beer to a temperature of about its freezing point in such a manner that ice crystals are formed therein in only minimal amounts. The resulting cooled beer is then mixed for a short period of time with a beer slurry containing ice crystals, without any appreciable collateral increase in the amount of ice crystals in the resulting mixture. Finally, the so-treated beer is extracted from the mixture." The company provides the following explanation about Labatt Ice and Maximum Ice for the layman: "During this unique process, the temperature is reduced until fine ice crystals form in the beer. Then using an exclusive process, the crystals are removed. The result is a full flavoured balanced beer." Labatt has sponsored the construction of many buildings in London, including Labatt Park, the John Labatt Centre, and the John Labatt Visual Arts Centre at the University of Western Ontario (UWO). Bessie Labatt's son Arthur Labatt was the 19th chancellor of UWO (2004–2008). In 1998 Labatt announced a 20-year sponsorship agreement with the now defunct Montreal Expos (now the Washington Nationals), which included naming rights for a downtown Montreal ballpark that was never built. From 1992 to 1997 they sponsored the English football team Nottingham Forest F.C.. They also are the official beer and corporate sponsor of the OHL hockey franchise Plymouth Whalers. In the 1950s, the company sponsored a PGA Tour golf tournament, the Labatt Open. Labatt was a sponsor of the Williams F1 racing team in the early 1990s. In 1983-86, Labatt sponsored Ken Westerfield, Canadian Frisbee champion and world record holder, to perform Frisbee shows throughout Ontario, as well as sponsor the World Guts (Frisbee) Championships on Toronto Islands in 1986. Labatt is a beer partner of the NFL's Buffalo Bills, as well as the NHL's Buffalo Sabres, Carolina Hurricanes, Columbus Blue Jackets, Detroit Red Wings, New York Islanders, Pittsburgh Penguins, and Philadelphia Flyers. Labatt sponsors the annual Labatt Blue Buffalo Pond Hockey Tournament. The outdoor amateur hockey tournament features more than 800 players. In May 2009, Labatt gave their support to a seventh NHL team in Canada, which was pursued by Jim Balsillie. In November 2018, Labatt USA opened Labatt Brew House, a 3,000 square foot (278 square meter) innovation brewery and tasting room in Buffalo, NY. Visitors may sample experimental beers or choose from a variety of established brews. Labatt Blue is sold in all provinces of Canada (most of the United States sells Labatt with sales particularly strong in the Midwest and Northeast along the Canada–United States border), although in Quebec it is sold under the French name Labatt Bleue, with a fleur-de-lis logo. Aside from the name, and containing 4.9% alcohol/volume instead of 5.0%, the red maple leaf on the logo has also been changed to a stylized red sheaf of wheat, which Labatt calls its symbol of "brewing quality." The business sponsored Nottingham Forest F.C. from 1992 (interchanging with Shipstones Brewery until 1994) to 1997. Under the Influence: Beer is to Canada as wine is to France. How Labatt and its allies brewed up a nation of beer drinkers. Smithsonian Channel. June 30, 2013. ^ Nurin, Tara (October 10, 2016). "It's Final: AB InBev Closes On Deal To Buy SABMiller". Forbes. Forbes. Archived from the original on February 3, 2017. Retrieved January 28, 2017. ^ ""Budweiser Canada"". www.budweiser.ca. Archived from the original on 1 May 2018. Retrieved 1 May 2018. ^ "Labatt - Good Things Brewing. ™". www.labatt.com. Archived from the original on 1 May 2018. Retrieved 1 May 2018. ^ Lara Jakes Jordan and Emily Fredrix (November 14, 2008). "US: InBev must sell Labatt USA to close Bud deal". USA Today. Archived from the original on February 25, 2011. Retrieved June 10, 2010. ^ "Anheuser-Busch Adds Kokanee and Alexander Keith's to Import Portfolio" (Press release). Anheuser-Busch. July 21, 2009. Archived from the original on July 2, 2013. Retrieved June 10, 2010 – via BeerAdvocate.com. ^ "Display Location: Labatt Brewery - Urban Exploration Resource". www.uer.ca. Archived from the original on 6 April 2017. Retrieved 1 May 2018. ^ "Labatt Blue from Labatt Breweries (InBev) - Ratebeer". www.ratebeer.com. Archived from the original on 2010-10-28. Retrieved 2010-05-10. ^ "Welcome - Labatt US". labattblueus.com. Archived from the original on 23 January 2013. Retrieved 1 May 2018. ^ "Of Malt Wort Patents (Class 426/16)". Pantents, Justia. Justia. 2017. Archived from the original on 2 February 2017. Retrieved 27 January 2017. ^ "Labatt Ice". The Beer Store. The Beer Store. 2017. Archived from the original on 2 February 2017. Retrieved 27 January 2017. ^ "TUC Hall of Fame Ken Westerfield". Toronto Ultimate Club. Archived from the original on 26 October 2014. Retrieved 22 October 2014. ^ "Labatt Blue Buffalo Pond Hockey Tournament". Labatt. Archived from the original on 27 February 2014. Retrieved 22 February 2014. ^ "Labatt pond-hockey tourney gets underway at RiverWorks". Buffalo Business First. 21 February 2014. Archived from the original on 11 April 2014. Retrieved 22 February 2014. ^ "Oh? Canada? Ads beg to differ". The Globe and Mail. Archived from the original on 2017-03-21. Retrieved 2017-03-20. ^ Moor, Dave. "Nottingham Forest". historicalkits.co.uk. Archived from the original on 3 November 2011. Retrieved 27 November 2011. Wikimedia Commons has media related to Labatt Brewing Company. 1970s Labatt's Beer Commercial - From the Internet Archive. CBC Archives CBC Radio reports on Interbrew's takeover of Labatt (From 1995).